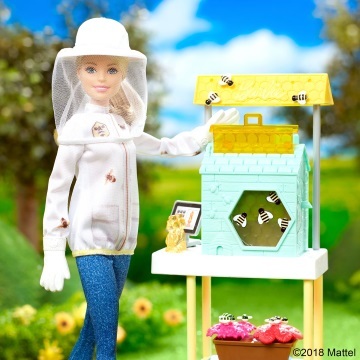 Barbie has been a beekeeper. Of course she has. This should surprise nobody. Barbie is, perhaps, the person to master the most varied collection of skills in the world. She makes Batman look like a slacker. So she’s a beekeeper. But how Beekeeper is she? Well, one of the great advantages of beekeeping is that it allows time for other pursuits. Beekeepers can climb the world’s highest mountains or make discoveries that will form the science of genetics and still be beekeepers. Beekeepers love to multi-task. But I feel like, if anything, Barbie has stretched herself too thin across her various occupations. I feel like she’s never really sat down and focused on her beekeeping. So here I hit a fork in the road. Is Barbie a woman who does everything, including beekeeping, or is she a beekeeper who does everything else as well? Sadly, I think it’s the former. It’s a shame, because as far as I’ve been able to suss out, Barbie has no problem with Beekeeper Rage, and the fact she’s served in the military (as evidenced by various other toys) suggests she has combat skills. There’s definitely media out there about Barbie solving mysteries. I’d bet there’s even Barbie tales in which she has supernatural powers. She has everything I want in a beekeeper, but not enough beekeeping. This has got to be the highest a Beekeeper can rank without actually dedicating their life to it. 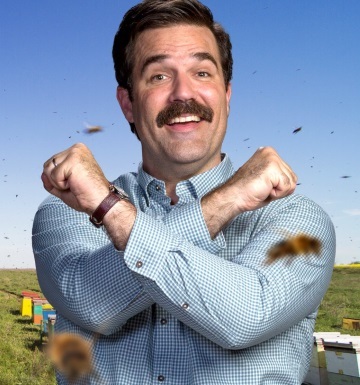 Today’s beekeeper is the famous Gutierrez, best known as Andy Richter’s personal beekeeper. Okay, “famous” may be overstating it. Even “known” is not quite accurate. Actually, this is probably as obscure as any beekeeper review could possibly get. It’s like this: One time on Conan O’Brien’s show in the 90s, they were doing a bit in which Andy Richter was hiding. Gutierrez was one of numerous people who were said to not know where Andy was. That’s it. That’s all we’ve got. He just shrugged and the camera moved on. Conan even stopped to comment on how much budget was probably wasted on the costume for such a stupid moment. But now to review him: Conan says “He’s clueless, Gutierrez” but that’s only regarding his knowledge about where Andy is at that given moment. He’s probably good at the beekeeping. He’s a professional, after all. And that’s enough for now. Gutierrez’s most important Beekeeper Power is the ability to be easily reviewed in about twenty minutes so that I can get a Review up before this month’s deadline without having to read a whole book or something. Thanks, Gutierrez! 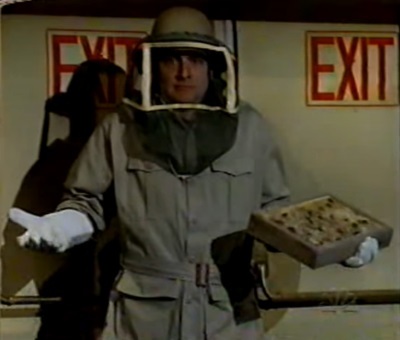 Today’s Beekeeper comes from an old-school episode of Doctor Who called Delta and the Bannermen. 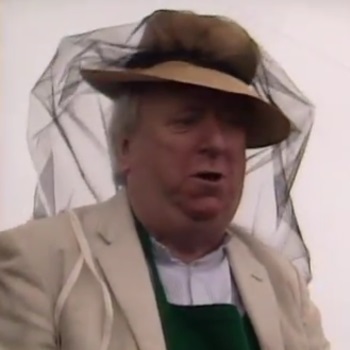 Goronwy Jones (using the surname that only appeared in the script because I like to be thorough) is a Welsh Beekeeper who gets caught up in one of the Doctor’s wacky adventures and doesn’t bat an eye. That’s the main thing about Goronwy: he is not surprised by much. 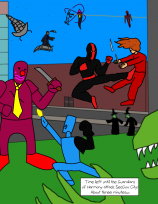 In this story a time-travelling alien asks Goronwy to help protect some other aliens from an army of still more aliens. During none of this does Goronwy question anything, he just happily lends his home and beekeeping supplies to the cause. During the tense confrontation, Goronwy takes the time to explain beekeeping stuff to anyone who will listen and can be seen casually reading a book. The only explanation is that Goronwy has seen weirder stuff before. Am I suggesting that Goronwy may even know the Doctor before this in some time-travel sense? Am I suggesting that he may even have been, in his youth, a companion to some version of the Doctor that we have not yet seen? Am I suggesting that he may be the most important character to ever appear in Doctor Who and even the Doctor doesn’t know it yet? Of course I am suggesting all of that. That’s what these Beekeeper Reviews are about, aren’t they? But actually, the episodes do make the case that Goronwy has a history, if not with the Doctor, with weirdness at least. When some Americans looking for a fallen satellite ask if he’s seen anything strange fall from the sky, Goronwy says “I’ve seen many things fall out of the sky, but nothing that could be described as weird” and he talks of strange lights (presumably UFOs) that he’s seen around the area. And does his own history with the bees seem supernatural? Well, it’s certainly mysterious that he can’t even say how long he’s been doing the job (because of time travel or old-person memory? Who can say?) 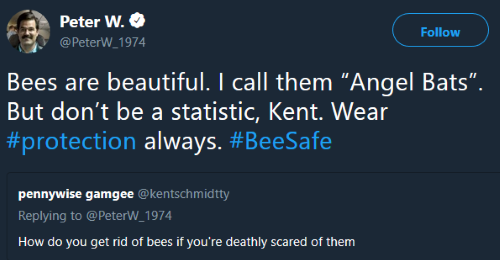 and he suggests that he can talk to his bees, saying “They know everything that happens.” Even without my bias, we’ve got hints that this guy is far from an “ordinary” beekeeper. At the end of the story, Goronwy gives the Doctor some honey and, as the Doctor furtively slips away from the Americans in the Tardis, Goronwy gives the camera a knowing wink. There’s definitely something up with this guy, everyone.